SSU 3 ambulance drivers wearing gas masks. RG1/002, AFS World War I Photographic Collection. This photograph cannot be reproduced outside the guidelines of United States Fair Use (17 U.S.C., Section 107) without advance permission from the AFS Archives. The American Field Service (AFS) ambulance and camion drivers were non-combatants in World War I, since their primary tasks involved carrying wounded soldiers and munitions. Although they were not directly involved in the fighting, the AFS Drivers were still exposed to many of the dangers encountered by soldiers, including chemical weaponry such as tear or mustard gas. 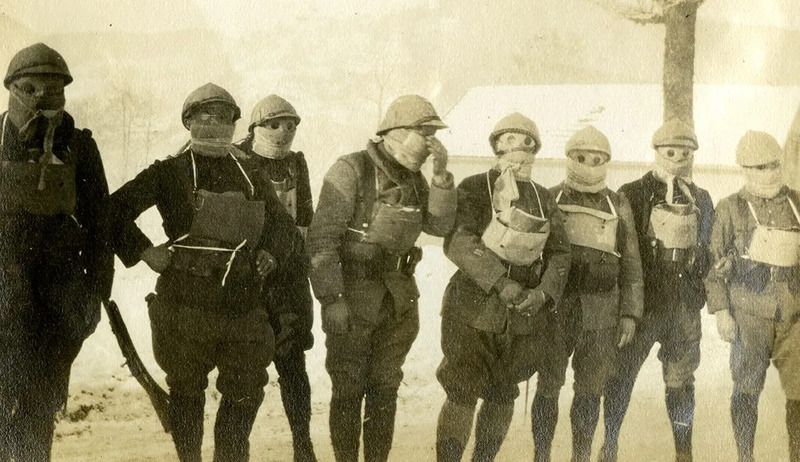 To protect against this form of chemical warfare, gas masks were often distributed to the AFS units. This event often served as a cause for commentary or a photograph, given the unusual appearance of the masks.